:This inspirational companion to Memory Rescue, Dr. Daniel Amen's groundbreaking book, is an invitation to discover the healing power of Scripture meditation and memorization as an intentional spiritual discipline. There is a reason the Bible calls us over and over again to "remember." Remembering God's acts, promises, and guidelines for living is essential to a healthy spiritual life. And as part of regular spiritual practices such as Scripture meditation and memorization, it can contribute to a healthier mind and body as well-reducing stress, increasing brain capacity, and even helping to reverse problems like memory loss. 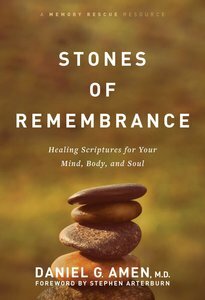 Whether purchased as a gift or as a practical spiritual follow-up to Memory Rescue, Stones of Remembrance is a wonderful resource to help cultivate the healing power of God-focused remembering.